So far, the crossed stick puzzles I’ve designed have been limited by the two-dimensional nature of designing for lasercut materials. But 3D printing presents another option for puzzles that can’t be formed from flat pieces. Consider connectors made of pairs of studs and holes as in the the puzzle on the left side of the image above. When we flip and rotate a piece with this type of connector in order to join it at right angles with another such piece, the studs on each piece match the holes on the other. But this only works when the two connectors have the same orientation. When a connector with a vertical stud pair is matched with a connector with a horizontal stud pair, both pairs of studs end up at the same position, so the connectors can’t join. We can call this connection scheme the same-match scheme, as opposed to the other-match scheme. 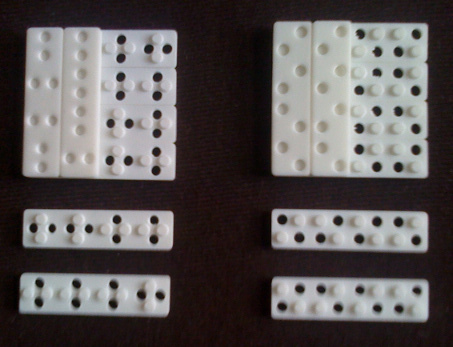 With diagonal pairs of studs and holes, (as on the right side above) flipping the piece swaps the positions of the studs and holes instead of keeping them in place. This means that the resulting puzzle will use the standard compatibility matrix. Initially, this may seem disappointing: after all, this is just the puzzle we could get without using stud and hole blocks. But in fact this setup allows us to use both compatibility schemes! If we place both layers of pieces so that the studs face the same direction, we have a puzzle using the same-match scheme. Some constraints become apparent at this point. 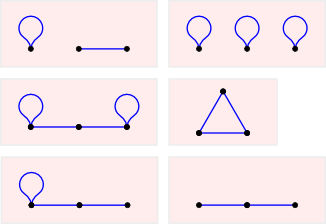 First, there can’t be a vertex with no edges, because that would represent a connection type that can’t connect to anything, and its presence would immediately render a puzzle unsolvable. Vertices that connect to everything (including themselves) are also problematic. Such a connection type doesn’t add to the challenge of a puzzle, and if all vertices had this property, the puzzle wouldn’t be a puzzle at all. I’m inclined to remove graphs with this kind of vertex from consideration for the time being, allowing that I may be wrong, and interesting puzzles using this kind of vertex may indeed be possible. Both the rightmost and the leftmost vertex in this graph are connected only to the center point. What this means in practice is that it doesn’t matter whether a connector has the leftmost vertex type or the rightmost vertex type; the connectors will behave exactly the same. But if this is so, there is effectively no difference between this connection scheme and the other-match binary scheme. For the connector types in a scheme to be distinguishable, each must have a different neighbor set. Another consideration that will be important is the density of the graphs. This quantity is the ratio of the degree of the vertices (or the average if the scheme is unbalanced) to the total number of vertices. The density will have an effect on the difficulty of the puzzle and the number of solutions, since a high density means that if we randomly distribute connections, each connection has a high likelihood of being valid. The following are the “good” ternary connection schemes under the above constraints. The schemes in the top row have density ⅓, and those in the bottom row have density ⅔.
I could keep going about how we could realize some of these schemes in 3D printed puzzles, and I could get into quaternary schemes, but longpost is already long, so I’ll save this for later.